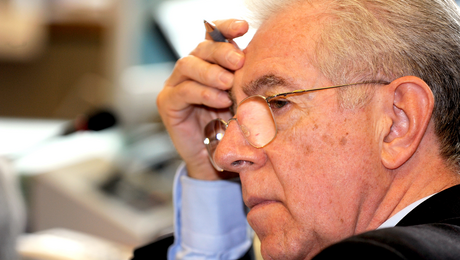 Monti, an ex-EU-commissioner, was appointed officially by the president of the republic. The absence of democratically endorsed characters will allow austerity measures to proceed without obstruction. “The absence of political personalities in the government will help rather than hinder a solid base of support for the government in the parliament and political parties because it will remove one ground for disagreement,” the foreign minister told reporters in the Italian capital. On 13 November, President Giorgio Napolitano appointed Monti, a committed free-marketeer, advisor to Goldman Sachs and two-time European commissioner, senator-for-life - normally a post reserved for individuals having achieved “outstanding patriotic merits in the social, scientific, artistic or literary field” rather than simply being seen as a safe pair of hands. The establishment of a new government by the president of the republic itself has raised eyebrows as the head of state is traditionally only a ceremonial post that has now been heavily politicized. It is self-evident that people’s democracy does not always work. Calling for an election could cause unexpected chaos; subsequently, leaders of the European Union decided on this shortcut. Although this type of technocratic government has been installed in many countries in the past, this definitely is new for the European Union. What this article reveals is that the people are willing to go along with this new government, hoping to end austerity - that being most unlikely. Yet a precedent is being set for unelected government officials to take over a sovereign country.